Lettershop Services | Mail-O-Matic Services Ltd.
Mail-O-Matic lettershop services are specifically designed to provide our clients with everything they require for successful direct mail campaigns. Our state-of-the-art lettershop equipment and quality control production flow help us minimize our production time and maximize your investment. 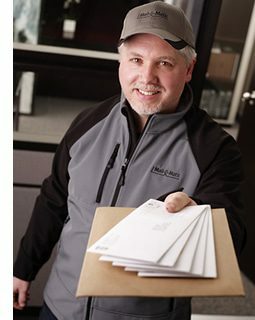 We have been providing superior direct mail marketing services to companies throughout Canada since 1967. We take the time to carefully work closely with you so our direct marketing services can help you save money on USA, international, and Canadian postage rates. Our all-inclusive lettershop services are perfect for any size of direct mailing campaign. Please contact Mail-O-Matic today for the most advanced lettershop services in Canada. Trust our knowledge and experience to produce your next direct mailing campaigns on time and on budget, every time. You want your mass mailing ad campaign to have a polished professional look, and you require stress-free direct marketing solutions. Mail-O-Matic’s highly-trained and helpful staff will answer all of your questions and explain how our lettershop services will take care of all your direct mailing needs.